Trees add color and texture to your yard. They frame your property and give it a “horizon.” They provide a natural jungle gym for your kids and blessed shade for the entire family when it’s hot outside. Of course you want trees! But what if you want artificial turf, too? 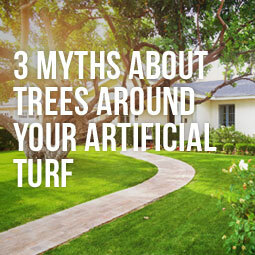 Maybe you’ve heard that trees and synthetic grass don’t mix. That’s a myth. And it’s not the only one. Generally speaking, roots grow downward, in search of moisture. That said, there are a few varieties of trees with very shallow roots that tend to push up the soil surface over time. It’s best to avoid these varieties in your yard where they will be surrounded by lawn. You don’t want to plant them next to your driveway or sidewalk or patio, either, because the roots will push up concrete or pavers. But so what? Eliminating a few varieties still leaves you with hundreds of gorgeous, ideal tree options no matter the size of your space or your personal preferences. And if you have an existing tree with bulging roots, don’t despair. Read on. There are dozens of synthetic grass products specifically engineered to ensure superior drainage. The barrier mesh keeps weeds from growing, but it doesn’t keep moisture from being absorbed by the soil where it can reach your trees. Technically, you could install fake grass right up to the tree’s trunk because there is no worry about potential mower damage. This can give your yard a “naturalized” appearance, but your trees will be happier and healthier if you provide a well around their base instead. For one thing, trunks expand as trees grow, and you don’t want to have to adjust your artificial grass over later on to accommodate that. Your “well” doesn’t have to be a hole or even a circle. Give it a more appealing free-form shape, and add some drought-resistant perennials, a ground cover, or a few spring bulbs to add color and soften the space. These provide a pretty contrast with your artificial grass, and the small plants won’t steal water from the tree. This is also a great way to accommodate your existing, beloved tree that is prone to surface-breaking roots. Create an “island garden” effect that extends to include all visible roots. With ground cover or a natural mulch such as shredded bark, the roots won’t even be noticeable, let alone cause a problem. No artificial grass upheaval, no tripping hazards. In other words, you won’t be able to get rid of all the leaves your trees drop. This is ridiculous. You can use an air blower on fake grass, any number of rake types, or even a power broom. Leaves and debris no more! Trees can create deep shade, acidic soil, etc. that make it impossible to grow natural grass. But you can plant artificial turf anywhere, regardless of soil or atmospheric conditions. That means you can have the yard you want instead of the yard you’re stuck with. The bottom line? Both trees and Synthetic grass increase your home’s value. And that’s no myth. This entry was posted in Garden, Synthetic Grass by jordan1. Bookmark the permalink.